Our Resilient Youth Resilience Survey dataset of more than 250,000 young Australians shows strong correlations between bullying, student resilience, mental health and learning engagement. For example, Australian primary and secondary school students who are bullied are 1.5 times more likely to be disengaged from learning. In response, Resilient Youth has prioritized the development of a new Bullying Survey for roll-out in 2019. On Monday 30th July Resilient Youth and our research partners at the University of South Australia hosted a formal Focus Group with leaders in the field of education and bullying, to develop items for the new Relationships & Bullying Survey. The session was chaired by Resilient Youth Advisory Member John Hendry (OAM). The aim of the session was to gain insight from our expert panel on childhood bullying in schools. An important topic of the session was feedback gathered about the Relationships & Bullying Survey from young people themselves, gathered from focus groups conducted at a secondary college in the week prior. The University of South Australia is home to the Peer Relations Assessment Questionnaire (PRAQ) and other bullying instruments developed by Professor Ken Rigby. We are pleased to report that the new Resilient Youth Relationships & Bullying Survey developed with Uni SA will provide a comprehensive profile of overt, covert and online bullying, relevant to the school context of 2019 and beyond. The new Relationships & Bullying Survey will be validated with a sample of Victorian primary and secondary schools in Term 4 2018 and available to all schools early 2019. This project has been approved by the University of South Australia's Human Research Ethics Committee. 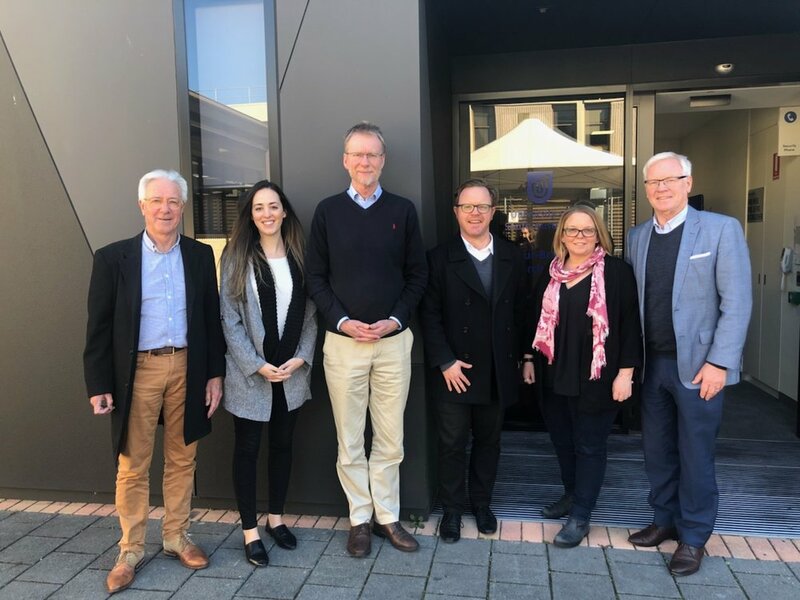 Image: Taken 24th August 2018 with our research partners at the University of South Australia Behaviour Brain Body Centre: (L-R): John Hendry (OAM), Dr. Stephanie Centofanti, Professor Kurt Lushington, Dr. Andrew Wicking, Associate Professor Jillian Dorrian, Peter Wicking. Professor Lushington and the team are supporting us to develop the revised Resilience Survey, our new Relationships and Bullying Survey and the new School Staff Resilience Survey, available 2019.